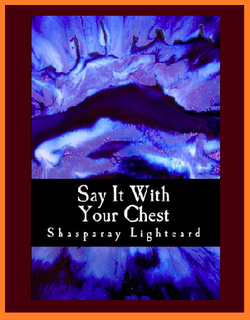 When Red Orchid founder Melanny Henson selected Shasparay Lighteard's book of poetry, Say it With Your Chest, for the 30 Writer Career Launch, she had no idea she was accepting the manuscript of a 16 year old girl. The prose was clean, engaging and brimming with heart, and Melanny felt it would appeal well to a broad audience. Weeks later, she discovered that the contract would have to be revised to accommodate a minor.The book grapples with identity, gender, sexism and the power of internal strength. Shasparay's debut into the writing world is certain to leave its mark.